Don't assume just because your crane picks a load it is designed to do so. Your systems should be marked for capacity. If not, an engineering study should be performed to confirm the capacity. We can do an in-house study if the manufacturer drawings are available or we can go to your site and take the necessary information. Complete plant/facility studies of existing and possibly outdated hoist, crane and monorail systems. Many existing systems have been designed and installed by maintenance personnel "playing engineer". Many of these systems are structurally unsound and are accidents waiting to happen with you as the sole owner of liability. Questionable or unmarked systems should all be checked for capacity to insure compliance with all applicable ANSI, OSHA, CMAA, and AISC specifications. 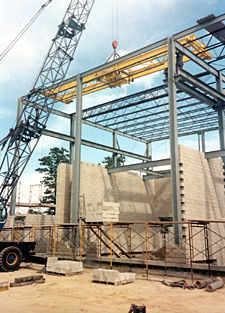 Burlington Engineering Crane and Hoist offers the solution to these problems.